How exactly did I get into these home improvement shows? Back in the day, if I had my druthers, I would have watched anything but the home improvement channel. Well, that and the surgery channel (blood is not my thing). I was into Kelly Kapowski, the crew from Friends, even Days of Our Lives, but nothing with houses. To me houses were boring. No longer. It all started when I began dating Heidi, who had already renovated an old home all on her own. Well, she had done a lot of the demolition work, decided and ordered all of the supplies, and even installed quite a bit of the internal and external components of a large country home. It turns out she actually likes all of that stuff, all of the grit and dirty-hands-fun involved with demolition and renovation of houses. Then we bought this place, and boy did it need a lot of TLC. It too was an older house, and a lot smaller than the place she had previously renovated, but we had a lot of work to do on it just the same. After tearing out walls, fake fireplaces, and small closets, cleaning everything thoroughly, painting, having cabinetry and new closets put in, it was like a new home in here. Along the way, after the initial work was done, my wife has had a vision for changing even more. Now we live in a wonderfully apportioned home with lots of storage. She’s just really good at this kind of stuff. Then, when we finally got DirecTV a few years back and she discovered these home improvement channels, it was on like Donkey Kong. 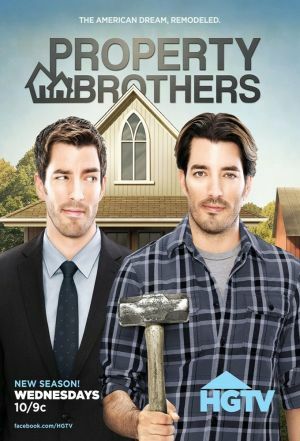 Suddenly we began DVR’ing shows like Extreme Makeover, Design On a Dime, and her personal favorite — the Property Brothers. Every night she watched one or another of those programs, and by the process of osmosis, I guess, I began getting into them too, so much so that I started watching some of the episodes even when I was the only one home. Now, we have a routine nearly every night where we fire up an episode of either Property Brothers, Buying and Selling, or Brother vs. Brother (we kind of like those brothers) while the girls are getting their hair done after bath, and they watch right along with us. Maybe one or both of them will grow up to be renovators of their own places. I wouldn’t put it past them. As long as they put in a room for their old man so he can hang out when he visits. Of course, though, the big problem with watching so many of these shows is that I start to get dissatisfied with my home as it is. I keep seeing ways it could be “better,” and driving myself crazy over it. I mean, do we honestly need a bidet or would that just be overkill? Be honest now. Seriously, though, that’s the gift and the curse of home improvement/renovation shows, but I guess I’ll take the upside and let the downside take care of itself. Regardless, while I like the shows, I’m neither the demolition nor the renovation expert, so if anything else gets done to this house, it will be my wife’s vision. And I’m okay with that. She’s done a great job so far. Love your blog! Very funny though am slightly disturbed by the idea of a ‘surgery channel’. Was that for comic affect?? I’m grateful we don’t have it in Australia! Long live HGTV! Surgery channel! That’s too much! Its a rare occasion that its a good thing to live in a small tv market. We only have a few dozen channels. No blood and guts tv here thank goodness. Although we do get Fox News lol! Perhaps I can watch Fox and sing ‘let it go’. I’ll sing along with you. Off key but it means the same, right? Yes, it really does. In fact it has to be off key! Nothing wrong with being addicted to kids films. It’s when you watch them without the kids that makes it an issue. 😉 Keep those tissues handy!